The Rockstar Energy, Polaris, UTV Wolfpack team’s weekend race was business as usual once again. The Lucas Oil Regional Series Saturday had a change of scenery racing at Glen Helen Raceway in San Bernardino, CA, July 19th. Glen Helens track is notorious for the rocks and ruts. The Wolfpack Team started off the weekend with practice on Friday followed by qualifying and the main event on Saturday. It was a great race weekend with a packed crowd and over 51 UTV’s entered to battle under the lights. This weekend was also the largest amount of entries for the new production 1000 class with the Merrell brothers going head to head with 21 experienced drivers making this a fun and competitive race day. 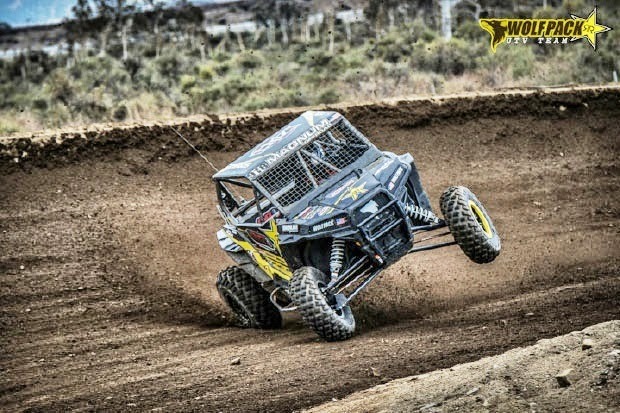 The wolfpack roster hit the most drivers ever to race in the same day this weekend, with Driver Jeremy Merrell in the #977 Polaris RZR XP1000 built by Magnum off-road, Jason Merrell driving the #918 Polaris RZR XP1000, George Hammel driving the Supercuts Wolfpack car, Driver Jacob Shaw coming back for more short course action in the RZR XP900 racing the unlimited UTV class and Driver Will Rodgers piloting his XP900 in the stock RZR900 class. With so many talented drivers on the wolfpack team we were bound to see some great racing this weekend. Jacob Shaw started the weekend off battling experienced drivers in short course, this was Jacobs first short course race in this class, he came out to shock the crowd finishing first in qualifiers. Starting off the beginning of the final race the drivers were aggressive and out to win. Jacob would stay toward the front of the pack all race and finish in 5th place. What else can I say other than Glen Helen under the lights = exciting racing! The racing was wheel-to-wheel all weekend! Friday practice was a learning curve with the loamy dirt, but the track was awesome and really cool to see the different terrain. With all the Pro vehicles (Pro4, Pro2, Prolite, and Pro Buggies) on the track the ruts were insane, it was super cool to be able to drive in those conditions! Saturday we found s couple issues with the car, a ball-joint needed to be replaced and a leaky rear diff seal. These Polaris RZR’s are built so well, sometimes I wonder how they take the beating that we give them. A little refill of the read diff oil and a ball-joint and we were good to go. Qualifying went as good as possible, the car was a bit slow and we ended up qualifying 10th, but knew that some changes could be made to improve the cars speed. For the Main Event we stiffened up the sway bar and that made huge difference in the car being more stable and locked the backend to the ground much better. Starting from the 10th position we moved up a few positions pretty quickly and had some great battles. My starts were mediocre at best and I got passed a few times, but made it back up on track and ended up 7th for the night, battling all the way many drivers and some awesome back and forth with teammate Will Rodgers during the last 2 laps! During the main event we learned that the car is jetted way to rich and can perform much better, so some testing is in the near future to get it up to par with the other cars on the track, but all in all I can’t thank my family, friends, and partners for all their help, the Lucas Regional series is a blast and these RZR’s are the future of short course racing! Some other highlights for the weekend were seeing my sister at the races, meeting the newest Wolfpack member Mason Merrell and seeing all our friends. I can’t wait to be back at Glen Helen Sept 6th for some redemption!!! The races came to an end for the wolfpack team finishing the weekend off with the production 1000 class with drivers Jeremy and Jason Merrell. They would start off the race toward the end of the pack with Jeremy Merrell starting in 15th place and Jason Merrell in 14th. Starting in the back Jason knew he had his work cut out for him. From start to finish in the final race he would battle cars sliding out in front of him and running into him. It was a battle against the brothers in the start of the race with Jeremy doing everything he could to prevent Jason from passing him. Jason would eventually take the outside to by pass Jeremy and make an impressive climb toward the front of the pack to finish the weekend with a 5th place. Jeremy having mechanical problems would fall back to finish the race in 10th. During the race Jason showed some great driving skills by saving from flipping but as a result lost his power steering and still managed to finished 5th. The Wolfpack Race Team would like to thank all of our great sponsors that keep us alive.